There are more than 100 million Americans who suffer from chronic pain. Since the 1990s, opioid painkillers have been the go-to treatment. But good intentions gave way to an epidemic… one that’s just been declared a public health crisis by the president. In 2014 alone, 7.8 billion pills of hydrocodone (also known as Vicodin) were distributed across the U.S.
That’s roughly a Vicodin per day for every man, woman and child in the U.S. for a month. That same year, 4.9 billion tablets of oxycodone (or Percocet) were handed out. It’s an unsettling fact, but the U.S. represents 99.7% of the world’s hydrocodone consumption. Unfortunately, Americans got addicted. Many eventually moved to more dangerous opioids. From 2002 to 2016, the number of deaths from heroin overdoses in the U.S. increased 533%. On average, 91 people die every day from an opioid overdose. In recent years, the U.S. government has finally taken action by introducing measures to roll back access to these powerful drugs. In 2014, the Drug Enforcement Agency reclassified hydrocodone as a Schedule 2 drug. In 2016, the Centers for Disease Control released new opioid guidelines. 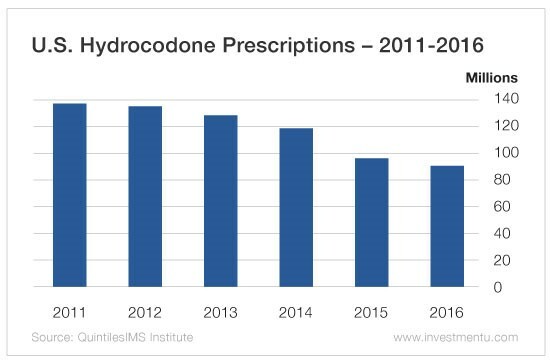 This year, the DEA is constricting the supply of hydrocodone by another 25%. The prescription quota is set at 58.4 million. That’s a 35% decline from the 90 million prescriptions in 2016 and a 57% decline from 2011. That’s the first time ever the FDA has ever taken such an action. We also saw Ohio, Missouri and Mississippi file lawsuits against Endo – as well as Allergan (NYSE: AGN), Johnson & Johnson (NYSE: JNJ) subsidiary Janssen Pharmaceuticals, Purdue Pharma and Teva Pharmaceutical Industries (NYSE: TEVA). The lawsuits allege that the companies engaged in a sustained marketing effort to downplay the addiction risks of opioids. 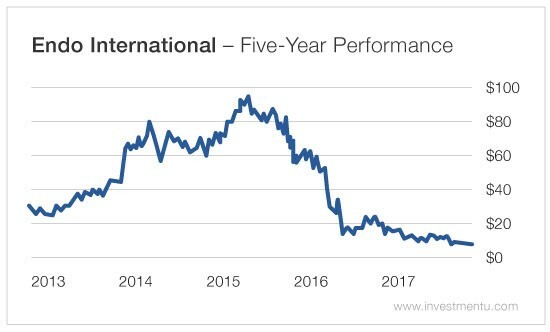 Today, it’s trading at less than $7… a far cry from the $94 it was trading at in early 2015. Endo’s earnings per share swung to a massive loss of more than $15 in 2016. Addressing the opioid crisis is a good thing. But it raises an important question: If the government limits opioid prescriptions, where are those 100 million Americans who suffer from chronic pain going to find relief? Well, there’s an emerging industry that could swoop in and ease the pain. Over the next few years, the global marijuana market will grow to $200 billion. That’ll be split between legal recreational use and medical use. But the medical side could have even more potential. Currently, 29 countries recognize some form of medical marijuana. And in the European Union, 12 of the 28 members have medical marijuana programs. Plus, Australia, Brazil, Chile, Israel, Jamaica, Mexico, South Africa and many others are looking to legalize medical marijuana or increase access to cannabis treatments. The No. 1 reason for prescription use of medical marijuana is pain. In other words, marijuana could be key for the U.S. – as well as the rest of the world – in the transition away from opioids. Now, what I have been a fan of – and readers of Oxford Resource Explorer have done exceptionally well with – is treating marijuana as a resource. That means focusing on countries where the industry has support at the federal level. And then focusing on suppliers and exporters. There are just four Canadian companies that dominate the medical marijuana export industry. Canada finds itself in a primo spot. 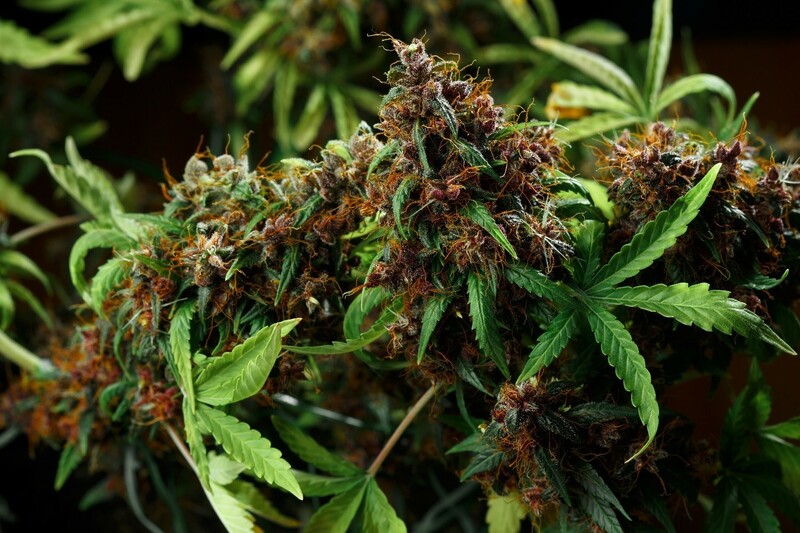 It has a first-mover advantage in the global medical marijuana market. And Canadian marijuana producers are ramping up production and expanding operations. As other countries legalize medical marijuana, they’re turning to Canada for supply. A More Sensible Way Forward? The U.S. has been blindsided by the opioid crisis. We’ve seen the pictures on television and across social media of parents passed out in their cars while their children cry. I’ll even wager that many of us know doctors who are overly eager to prescribe Vicodin, Percocet and similar drugs. The medical marijuana industry hopes to provide a safer alternative. And for investors, there are few opportunities in the industry I like more than the suppliers of this alternative.